Trattoria means, in Italian, an informal restaurant serving simple Italian dishes, and Doppio Zero refers to an ultra-fine ‘00’ flour that the restaurant uses to make its signature pastas. 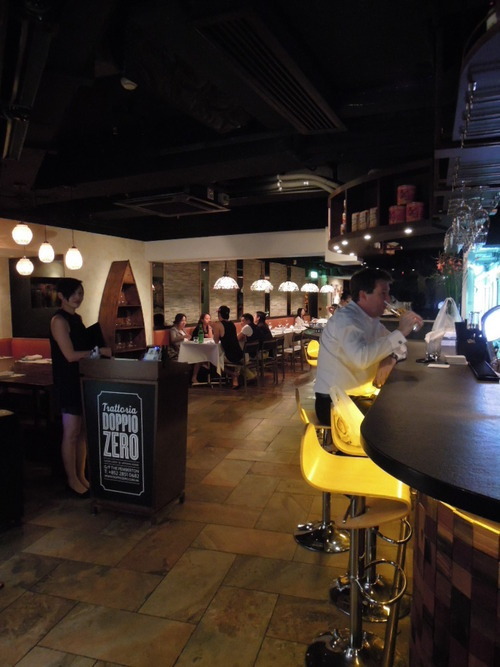 Opened by Chef Jake Addeo and ex-Management Consultant Kevin Shih, Trattoria Doppio Zero is a restaurant which specialises in fresh, handmade pasta cooked with seasonal ingredients. Located in Sheung Wan, the restaurant is a delightful new addition to Hong Kong’s list of restaurants that make fresh pastas, including Linguini Fini and Classified. Trattoria Doppio Zero has been recommended by the Michelin Guide and has been named the place for “Best Pasta” by WOM Guide. Very few things can taste better than a plate of hot, al dente handmade pasta and some homely Italian red wine, so my heart leaped with joy as I entered the restaurant in the basement of the Pemberton. The interior of the restaurant was rustic and homely, with a collection paintings and photos adorning its walls. As “Trattoria” suggests a cheap neighbourhood eatery, we were a bit surprised by the small portions of the dishes at the restaurant; fear not, however, as even though dinner here is not a bargain, they do serve some great-value set lunches which are available both during the week and in the weekend! 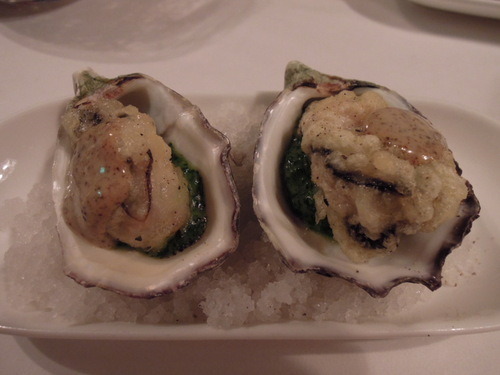 (1) We started off the Truffled Fried Oysters ($80), which at first sight looked absolutely tiny, but had exquisite tastes that made up for its deficiency in size – the flavours of the Black Truffle Aioli permeated the beautifully fried oyster, and the Creamed Spinach added an indulgent, creamy touch. 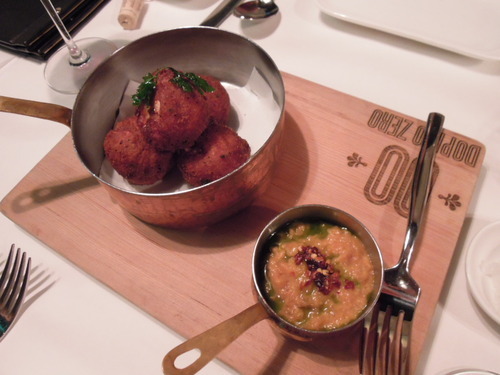 (2) The Fried Prosciutto Balls ($75), made up of Ricotta, Mozzarella and Pecorino, was equally addictive, with the incredible marriage of cheese and ham presented in the form of a crunchy little ball. The Honeydew Melon Sauce was subtle and slightly sweet and was just the right sauce for these Prosciutto balls. 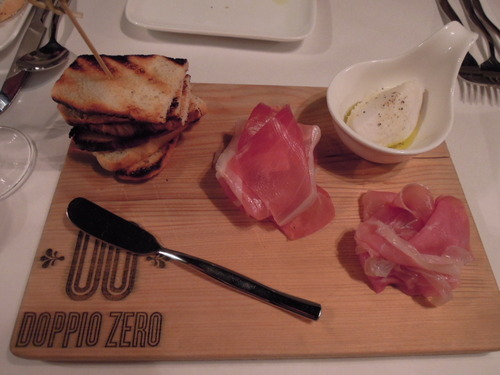 (3) Our third appetiser was the Affettati ($100), a platter with high quality Prosciutto di Parma and Speck. What was interesting was that we were given some “Whipped Lardo” to spread on the Grilled Focaccio – while the grilled focaccio was delectably light and crispy, we were not sure if the lard was worth the cholesterol, as it tasted a bit bland. (4) Getting to the main point of our visit, the first pasta we tried was the Chitarra ($225), which had in it Sea Urchin, Crab Roe and Tarragon. The waiter personally recommended this to us, and said that it was one of the ladies’ favourites at the restaurant. 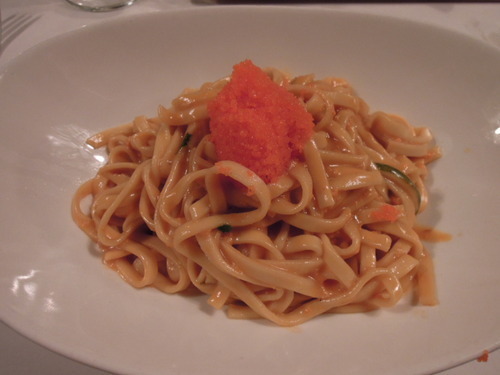 There are certain Asian touches on the menu, and this pasta’s use of crab roe and sea urchin is one of them. The freshness of the sea urchin and fish roe perfectly complemented the freshly hand-made pasta, making for a decadent, enjoyable fusion dish! My only complaint was that the hand-made pasta was on the soft side, probably because it was slightly overcooked. 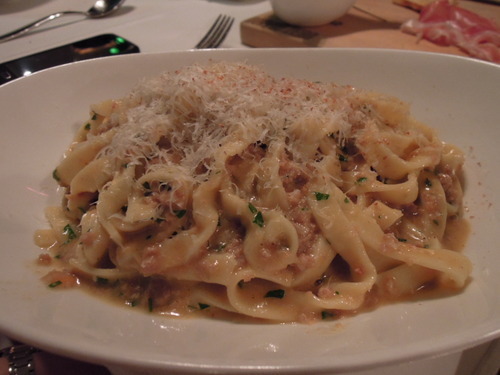 (5) The Tagliatelle ($220) was my personal favourite at the restaurant. It was served with a Classic Bolognese Sauce, some Parmigiano and Nutmeg. Many restaurants all over the world get Bolognese wrong – only a tiny bit of tomato paste should be used, and the sauce should never be red in colour! (See a Bolognese recipe I wrote for Foodie Magazine). The Bolognese sauce had natural, mellow flavours from the onion and pork, and the nutmeg gave the pasta a refreshing kick. What touched me the most, however, was this pasta’s authenticity! (6) The Tagliolini allo Zafferano ($220), with Soft Shell Crab, Saffron, Ginger, Garlic and Pepperconcini, was another Asian-inspired delight. 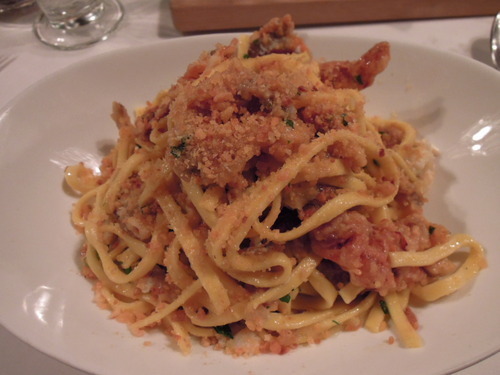 Even though the portions of dishes were generally small, the restaurant was very generous with the Soft Shell Crab, and there were large chunks of them scattered over the pasta. The garlic taste was sharp and distinctive, and my friend R kept saying that she felt like she was eating a Chinese lobster e-fu noodles (龍蝦伊麵)! The waiter explained to us that this Tagliolini was made with duck’s eggs instead of chicken’s eggs, so it was firmer and more al dente, and we all liked its texture! 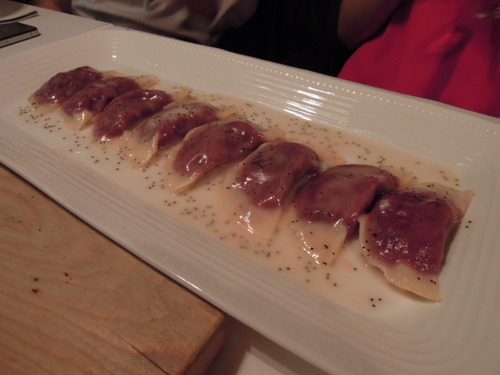 (7) The Ravioli ($195) is a signature dish at Trattoria, as it had a sumptuously smooth filling with Red Wine Braised Beetroot, Gorgonzola, Italian Butter and Poppy Seeds. I really am not a fan of beetroot’s grassy flavours, but I tried some of this anyway, and I acknowledge that the ravioli was butter soft and soothing, and the ravioli was nicely thin and delicate. If you are someone who eats beetroot, here’s one for you to try! (8) Lastly, the Spaghetti Neri ($205) was also commendable. 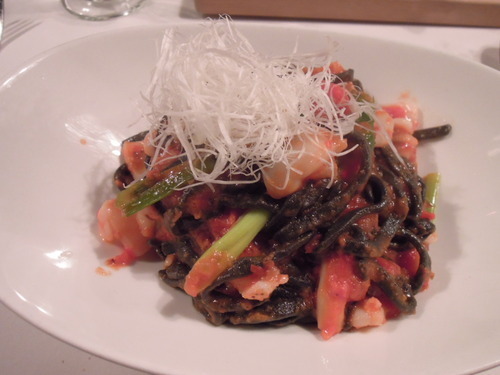 The pasta was made with cuttlefish ink, and was served with Baby Cuttlefish and seasoned with some Thai Chilies. The sauce was citrusy, with a hint of spiciness. The whole dish was rich with a combination of flavours, and the fresh taste of seafood particularly stood out – absolutely invigorating! Conclusion: The fresh, handmade pasta was admittedly one of the best I have had in Hong Kong, but it was unfortunately a bit on the soft side and therefore didn’t blow our minds. 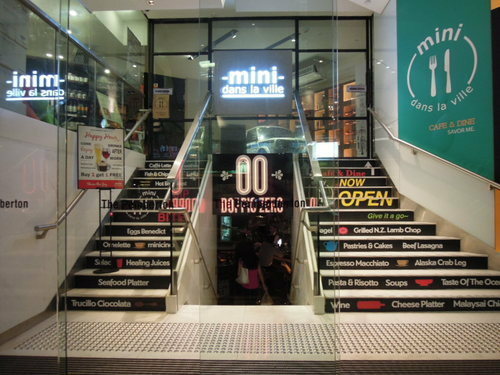 The food was definitely scrumptious, but there was just something amiss. Was it the slightly aloof attitude of the waiters that didn’t make us feel at home? Or the rather ungenerous portions? Perhaps we were being unrealistic in hoping for the type of pasta experience that we would get in Italy – we must not forget that the pastas in Italy will always taste better than in anywhere else in the world, thanks to Italy’s mineral-rich water!